The Maldives top court Sunday rejected a petition by President Abdulla Yameen to annul last month's election results and call a fresh poll, upholding his defeat. Under pressure from abroad, Yameen initially conceded defeat and said he would stand down on November 17 -- but then this month filed his petition despite the threat of sanctions. Yameen claimed magic ink had been used to rig the election and that ballots marked for him disappeared. At least 17 people have died after a train derailed and flipped over in Taiwan Sunday, authorities said. At least five carriages had flipped over and were lying on their side, according to an reporter at the scene. 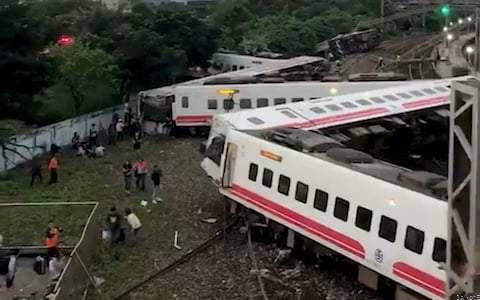 The high-speed Puyuma Express train completely derailed and lying zig-zagged across the track. The National Fire Agency said there had been 310 people on board the service en route to the southern city of Taitung. Rebels killed at least 11 people and abducted 15 others, including 10 children, in an overnight raid near Beni, near DR Congo's eastern border with Uganda, security sources said Sunday. Police recovered the bodies of 11 civilians killed in the town of Matete north of Beni, he said, adding that the missing children were from five to 10 years old, Beni police chief Colonel Safari Kazingufu told AFP. The attack, thought to have been carried out by members of the Ugandan Allied Democratic Forces (ADF), had targeted Beni, the regional army spokesman Captain Mak Hazukay told AFP. "We repulsed the attack but unfortunately, there were deaths among the civilians and soldiers," he said, without specifying how many soldiers had been killed. One local resident told AFP he had seen the bodies of two uniformed men at the site of the fighting. Earlier, a spokesman for the UN peacekeeping mission MONUSCO told AFP they had been involved in an exchange of fire with suspected rebels near Beni.